Boston isn't just a city that holds a special place in my heart because of how much we love visiting, it's also because I have family and friends scattered in several parts. While most of my family lives outside the city, my cousin and her young boys were down cheering on the runners yesterday but luckily are all safe. But as we know, not everyone was. A family is dealing with the loss of their 8 year old boy, another innocent victim lost their life, and countless people are injured at a event that is supposed to bring so much happiness. However, there ARE good people in this world that do good things. All of the first responders, bystanders who offered to help, and everyone who offered to donate blood chose goodness and we have to remember that. Let's focus on them. Today, I think we should all do something kind for someone else to show that you choose GOOD. Whether it be giving someone a simple compliment, letting your loved ones know how much you love them, or buying a coffee for a stranger....our country needs lots of love today! :) You choose your attitude and how you treat other people. Everyday is truly a blessing and since I also consider cookies a blessing (especially ones that involve Reese's), I'm sharing this recipe you all inquired about last week via my instagram. I will have my Nashville recap up tomorrow, but thought this seemed more light today and that we all needed a little bit of a pick me up! Plus, they are that good that they deserve their own post. These cookies are delicious-they are so soft and they manage to stay perfectly round and thick, instead of falling flat after they bake. They have two different types of Reese's in them (who wants just one? so addicting!) and are freezer friendly! These were gone in our house within a day or two, so do yourself a favor and make these for a loved one soon. These look so amazing. If I make these does that mean you will come visit? Glad your family is ok, such a sad situation! I have a tendency to only see the bad in this type of situation but I really like your outlook...choose Good! Thanks for that, Katie. on a happier note, those look BOMB. I'd basically just be stuffing recees into my mouth the entire time in making these! YUMMMMY!! Oh wow...these look SO good! 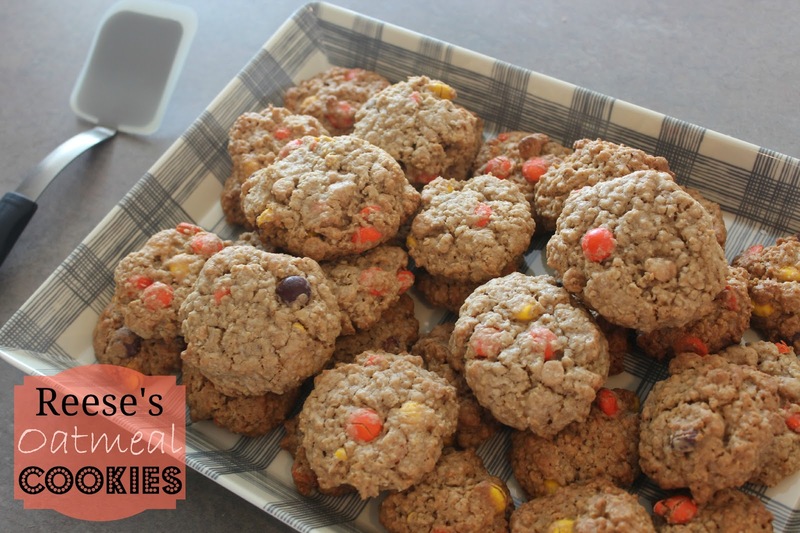 We love oatmeal chocolate chip cookies...we'll have to try this twist! Thank you for this post Katie! Living just west of Boston and growing up here this affected a lot of people I know. Friends of mine are first responders in the city and were part of those who helped. I will be donating blood on Friday to help do my part. Glad everyone in your family is okay. This would be a great recipe to try and drop off at the local police or fire department to help give them the energy to push forward. you're killin me!! Looks delish! Those look delicious! New follower! Stopping by from www.kjaggers.com.. Come Vist!! If you like what you see.. follow back! Have a great Tuesday! Adding these to by recipe box now! Can't wait to try them out. PB and Chocolate is one of my favorite combos. Looks so yummy bur Reese's Pieces never last long enough in my house to make them into cookies! Haha...hopefully someday I can try this recipe!